That's What She Fed: Go Shorty, it's ya birthday. Go Shorty, it's ya birthday. I entered my upper 20’s recently and to deflect the thoughts of getting a little older, my fiancé (don’t mind me, I’m still getting used to calling him that) spoiled me rotten with awesome meals. The first night we stayed in and enjoyed a home cooked meal (we will discuss birthday dinner #2 in our next post). 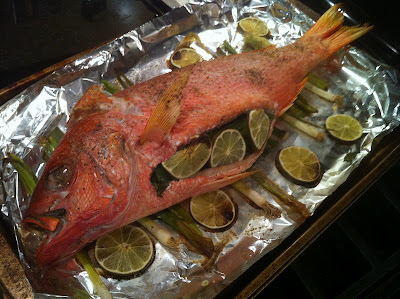 Chuck came up with a dinner that was incredibly tasty, and dare I say, healthy? He prepared a whole roasted red snapper with rice and asparagus sides. 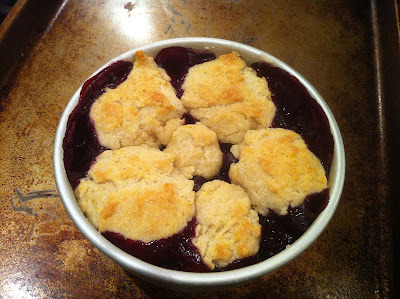 For dessert, he baked (from scratch - this is why I'm marrying him) a blueberry cobbler. Add chopped cilantro leaves, sliced scallions, chopped jalapeño, capers, garlic, the zest of 1 lime (and its juice), and a 1/2 cup olive oil. Season with black pepper, to taste. Cover and let stand until ready to use. Heat the oven to 450 degrees F and line your baking sheet with foil. Pat each fish dry and drizzle with olive oil. Generously season the outside and cavity of the fish with the salt and black pepper. Stuff the inside of the fish with slices from the remaining limes, slices of jalapeño, cilantro sprigs, and scallion bottoms. Bake for approximately 15-20 minutes (depending on the size of your fish) until the fish flakes when pressed gently with a fork. 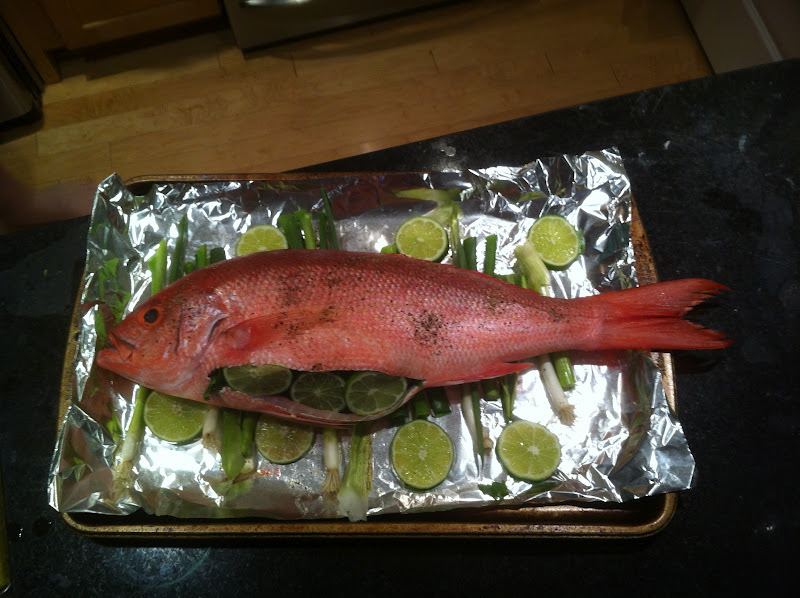 Serve fish with salsa verde on top or alongside. Toss the blueberries with 1/3 cup sugar and 1 tablespoon flour. 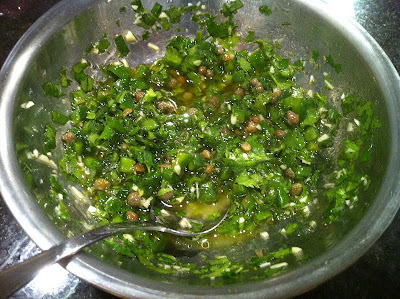 Pour mixture into your baking dish(es). In another bowl, combine the baking powder, salt, lemon zest, and the remaining flour and sugar. Blend the pieces of butter into the mixture with your hands, combining until you have a crumb-like consistency. Add heavy cream and mix until the dough forms. Drop mounds of dough over the blueberry mixture (I would recommend at least one mound per person). Bake for approximately 35-40 minutes, until the dough mounds are golden and the berries are bubbling (be careful!). For each person, spoon a large bowl of blueberries and top with dough. We also love this with vanilla ice cream. **Note: Depending on the season, feel free to substitute the blueberry with just about any other berry. This will be our go-to cobbler recipe for the year.